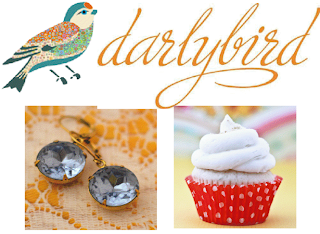 i am excited today to introduce you to darlybird, my newest sponsor. darlybird is a fun online shop with unique, hand-made and vintage jewelry, party supplies, and miscellaneous sundries (i love that word, sundries). if you're looking for something really rad, might i recommend the earring of the month club? are you interested in sponsoring nat the fat rat? Earring of the month club. Brilliant. I should have thought of that. Totally just became a card toting member of the EOTM club! I drank that Kool-Aid fast, man! oh man, wish i had a random $100 for the EOTM club! i love earrings (even tho i currently forget to put any in about 75% of the time...then pout about it while at work.LOL)!! Welcome to NTFR, Darlybird! What a pretty logo. It's like wine of the month club...I want to be a member!